This guide walks you through how to complete an online application form via the Raisebook platform. After registering your interest, selecting an entity and submitting a bid, you will receive an email. 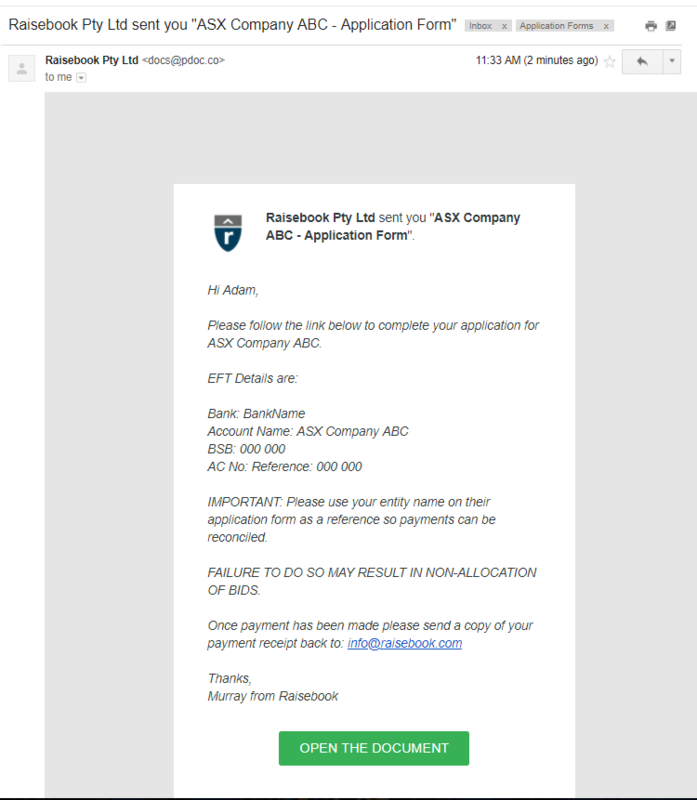 Subject will be: Raisebook Pty Ltd sent you "COMPANY NAME - Application Form"
Once the page loads you will find your online application form. You must complete the red highlighted fields, green fields are optional depending on your entity. Click the Next button to navigate through the required fields. The counter in the bottom left tracks the number of required fields still to be completed. Once all fields are completed click the button Click to Complete. Once completed the below popup will appear informing you that the document is completed. From here you are able to download a PDF copy of your completed form. Please note - the URL will only be available for 30 days. We recommend you download a copy for your records. Once completed, you will receive an email informing you of the document's completion, and providing a link to return to the form and download a copy.